Hi everyone and welcome to our Fall Blog Hop. I’ve been very excited for this tour because I love table setting and entertaining, especially as fall and then the holidays roll around! If you love setting tables as well, check out my table settings and tips and advice in my new free e-book! 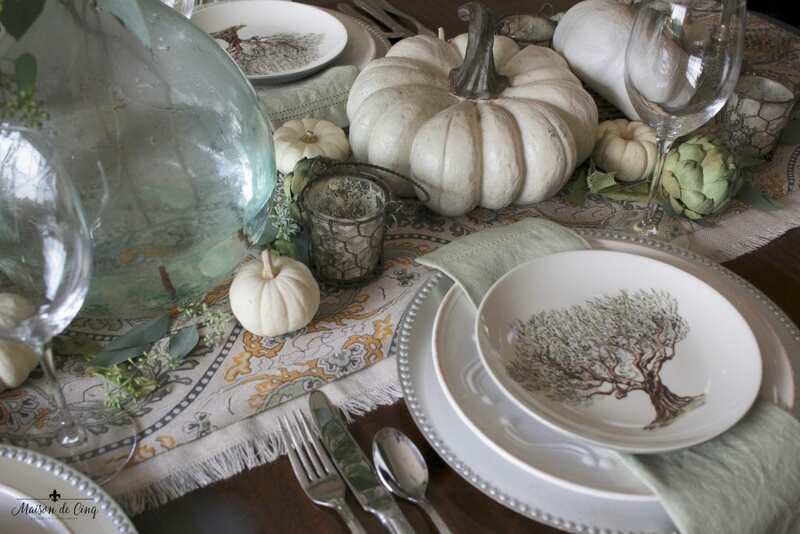 Today I’m sharing an elegant fall tablescape done in neutrals and greens. If you’ve visited me here before, then you know that I’m not a huge fan of the traditional fall colors of oranges and rusts. But I absolutely love the season! So, I had to find a way to celebrate the season while going with a non-traditional color palette. 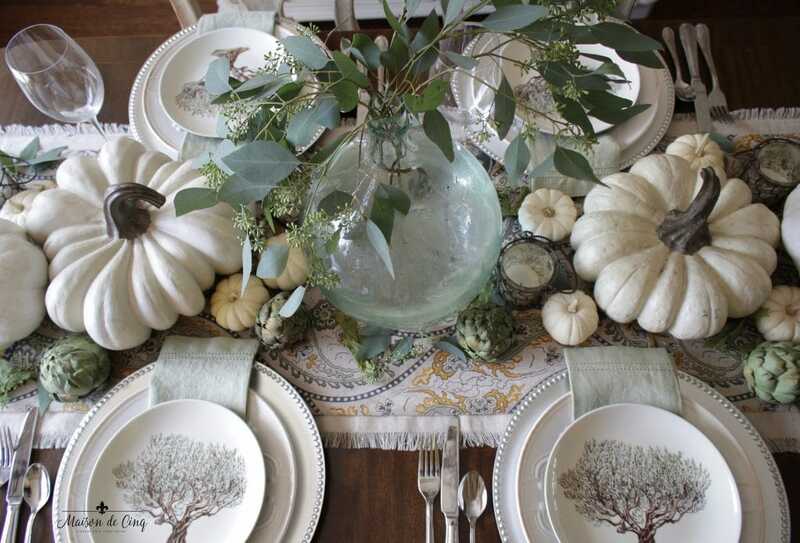 I think this elegant fall tablescape still says “fall,” without being over the top. 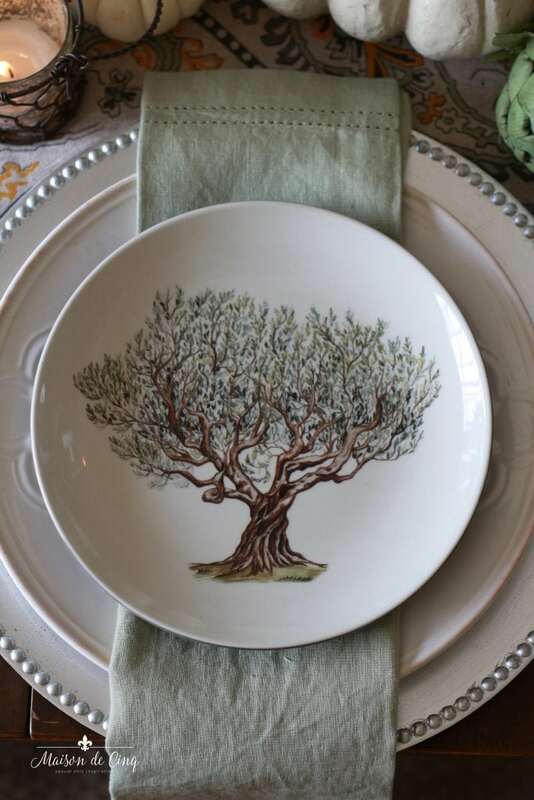 As I always do, I started with my salad plates…. How cute are these plates?! The second I saw them at Williams Sonoma I knew they would set the tone for the whole table. I love the tree and the subtle browns and olive greens are just the palette I was looking for! I knew I wanted to use only white and/or green pumpkins, but it’s so early, all I could find were the tiny baby boo white ones. The other larger white ones are faux which I found at Home Goods. The artichokes are Pottery Barn from a couple of years ago, but I’ve now seen them on Etsy. The patterned runner was one I also found at Home Goods. I chose it because I loved the greens and greys in it, and because again, it didn’t scream Thanksgiving. I layered it over a fringed linen runner for added texture. The sage green linen napkins are the perfect soft color and really keep the table subtle, I think. And these work in literally any season! I could see them on a Christmas or even a spring table as well. 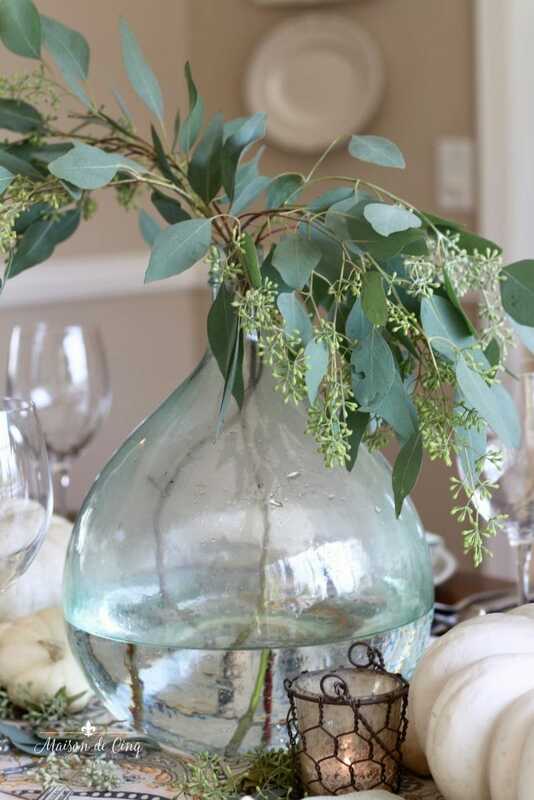 The focal point of the table is an antique French demijohn filled with seeded eucalyptus. I love the simplicity of the bottle, and of course, the color was perfect! For more information on how to style demijohns, you can read my whole post on them here. 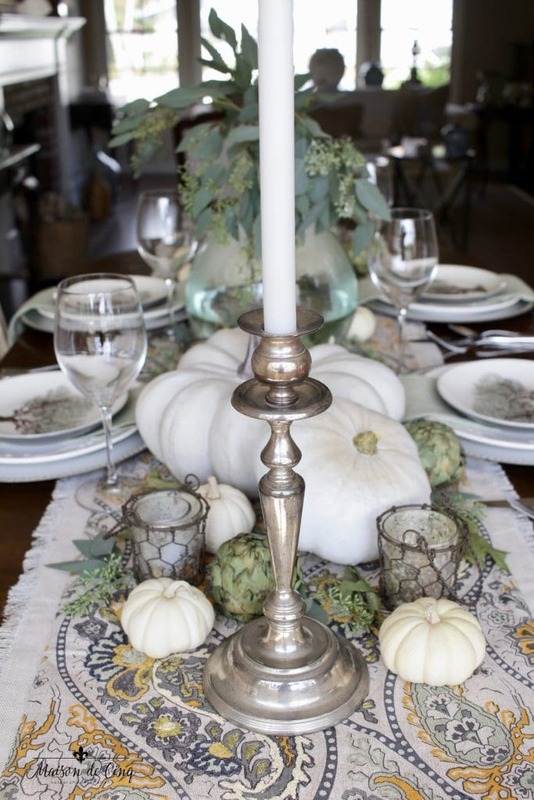 The demijohn combined with the small and large white pumpkins, artichokes, more eucalyptus, vintage silver candlesticks, and chicken wire votives covers the center of the table. I love layering plates and chargers – I’m sure I’d use 5 or 6 if I could! Here I used a silver charger first, followed by my everyday white plates, and then the Williams Sonoma plate. 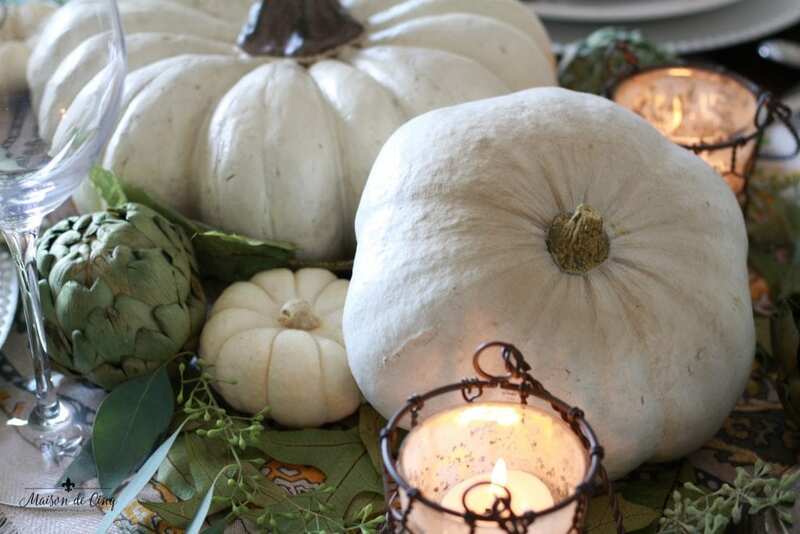 To me, this table feels autumn-y yet still so neutral. By using greens and neutrals, with a subtle nod to the changing seasons and items from nature, I think it’s an elegant fall tablescape that still has a warm and cozy vibe! 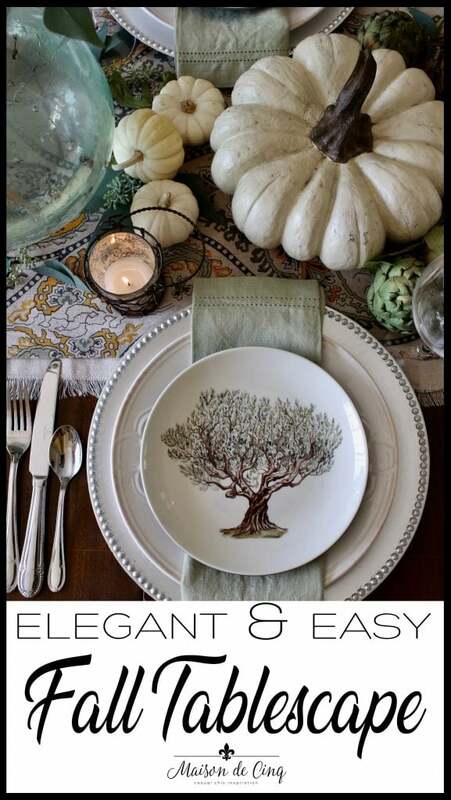 If you’d like to see some of my past fall tablescapes, you can click here, here and here. You can also get a whole year’s worth of pretty (and easy!) tablescapes by subscribing to my blog and downloading my free e-book, A Calendar of Tablescapes! I think this is my favorite tablescape ever! I love the softness of the non-traditional fall color palette. Every piece adds a special layer and makes it interesting! Simply beautiful! What a sweet compliment Tonya! Thank you so much – I’m so glad you liked it! Very pretty table, one of my favorites so far this fall! Thank you so very much Ann! I so appreciate your kind words and you taking the time to comment! Sheila Your whole table is so beautiful. I love the soft turquoise and hints of Fall colors. Great job! Your whole table is just overflowing with Fall enchantments! You’ve done it again Sheila! You table is magnificent! I love your color palette! And your centerpiece decor is just stunning! 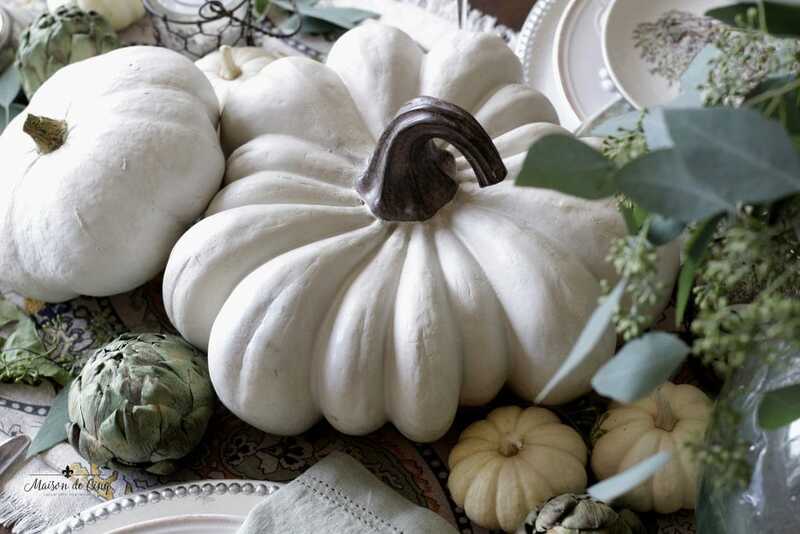 You have set the bar for my fall table now….so high! Thank you for that! Oh Sheila, so gorgeous! I love your color scheme. Those plates are beautiful. The whole table is fabulous my friend!!! It’s so pretty, Sheila!! love decorating for fall! Sheila, this tablescape is absolutely stunning my friend! What gorgeous colors and layers…that runner is so rich looking and I just love it! 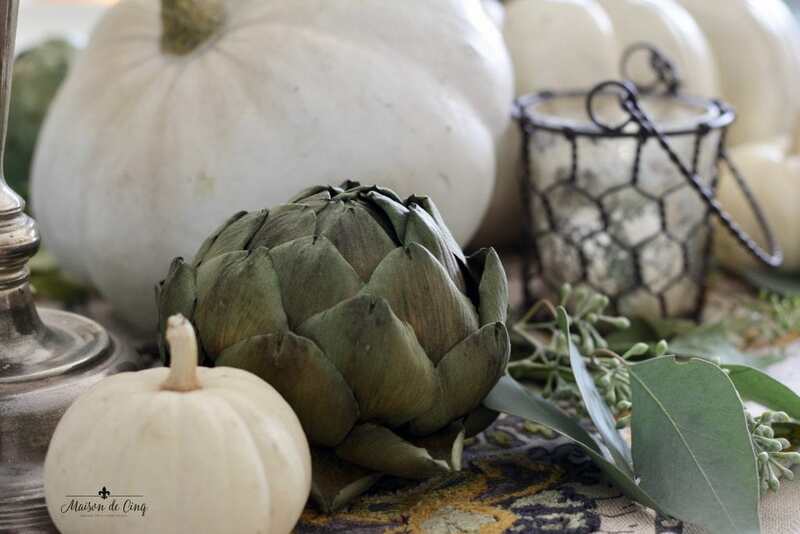 The greens and creams are so elegant and those artichokes are the perfect compliment to all of it! I am so inspired by this and I just may have to use this palette sometime soon! So gorgeous! Apparently I keep using greens – I can’t help myself! And yes, use this palette! It would look great in your gorgeous dining room! What a beautiful tablescape Sheila! I love all the layered textures and patterns. Well done! Thank you so much Ashley, so appreciate it! 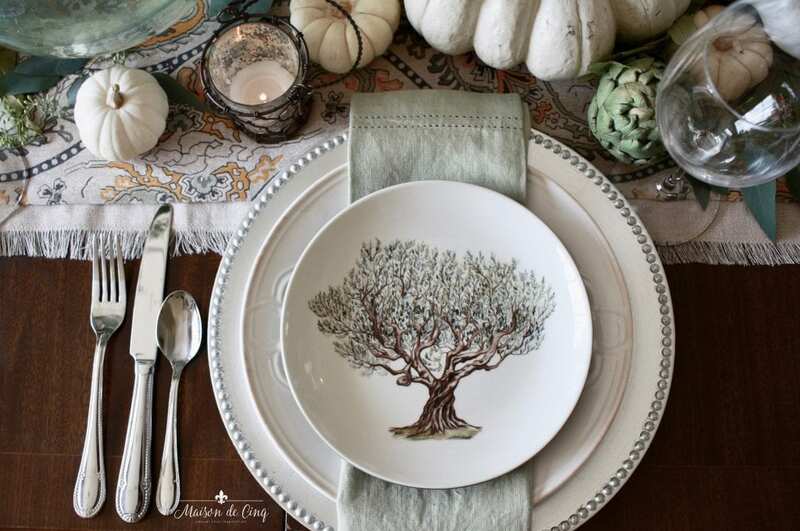 Sheila you’ve done it again with a gorgeous elegant tablescape! I love the neutral tones and addition of soft green! So happy to be doing this tour with you again! Thanks so much Kim! I love that soft green – definitely my color! I was in Williams Sonoma yesterday and saw those dishes…so pretty. Did you see the gray glass s to hey had with them? Thanks! Aren’t they great?! I mean, I just fell in love with them! And no, my WS didn’t have grey glasses with it, or at least I didn’t notice. I bet they were gorgeous! I love how you started with the gorgeous plate and then decorated around it. All your elements are perfect and so rich with color and texture. Everything works fabulously together and I just love this table! 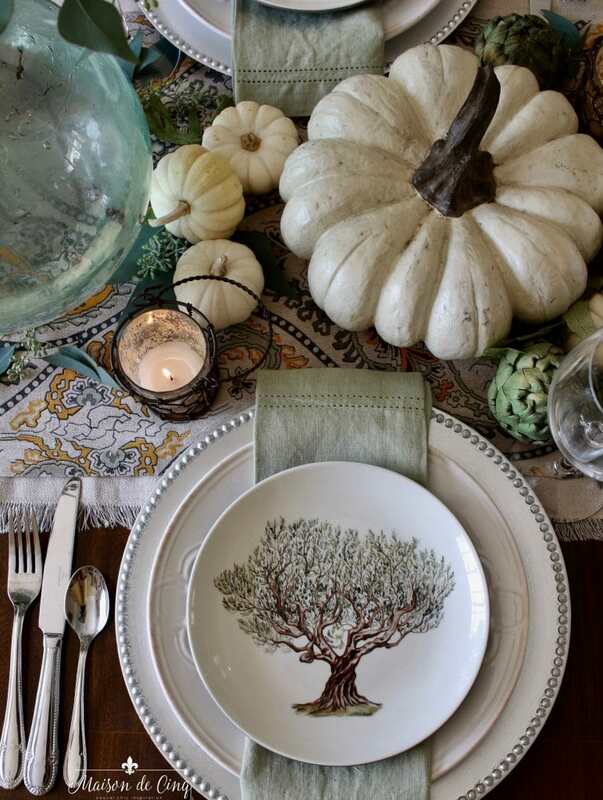 You have a great style and it is clearly evident in this tablescape! I always start with the plate! It really sets the tone for me and then I work from there. I know other people start with linens, or even the centerpiece, but this works for me I guess! Thank you sweet friend! 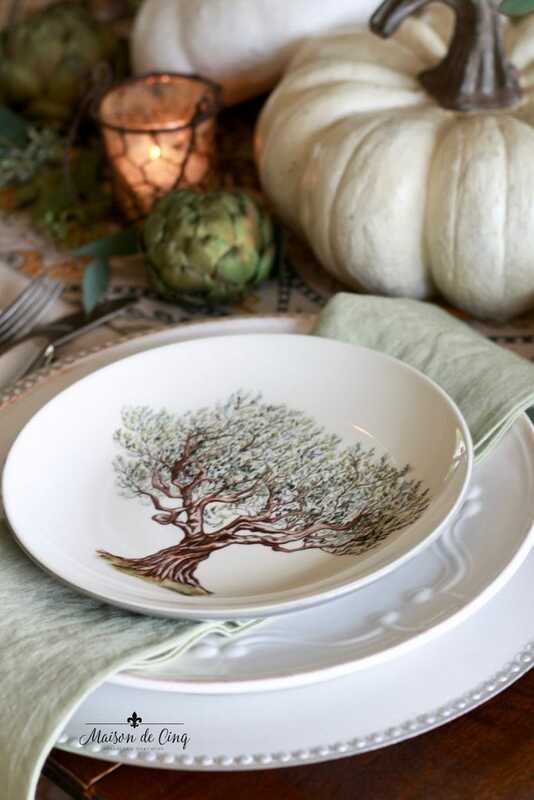 I love the plates too- aren’t they just so perfect for early fall?! Loved hopping with you, as always! Hi Sheila, I thought I had you in my personal email, but I guess I don’t. On your post with the bread bowls there was an oval one with candles and succulants. Was that yours? Did you plant that one? I was thinking of doing that and wandering about how to go about it. Don’t want to ruin the bowl with dirt. Any words of wisdom?? First of all, who doesn’t LOVE eucalyptus?! I adore those salad plates, it’s all stunning Sheila! So fun hopping with you this time Martha! Gorgeous table, Sheila! I love the soft colors which seem just right this time of year. I know how much you love fall so I hope you get to enjoy every moment! I DO love fall!! And thanks Shelley – I wanted a softer feel so I’m glad you think I achieved it! Love the color palette for fall!!! 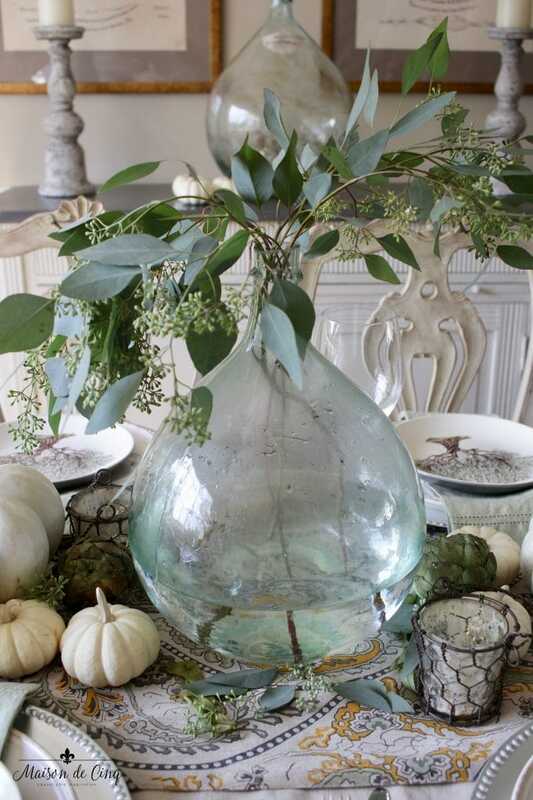 And that demijohn centerpiece is beautiful! Thanks for the inspo! Thank you Jen!! I’m SO glad you came over! And it means so much that you like it.